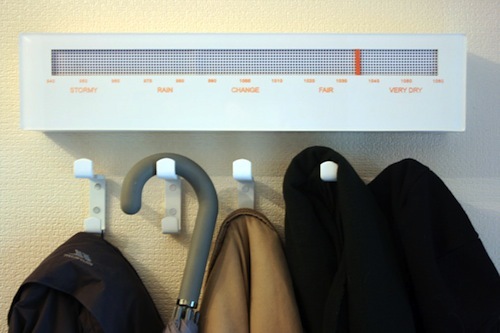 Online Coat Rack Reminds You That You'll Need A Jacket | OhGizmo! By Chris Scott Barr on 06/07/10 • Leave a comment! How many times have you rushed out the door, only to figure out that it’s not quite as warm/cold as you’d expected it to be? I’m guilty of doing that all too often. It’s even worse when your car is in a garage, as you don’t realize that you should have grabbed a jacket until you’ve already arrived at your destination. Sometimes I remember to check the weather on my iPhone (or actually step outside for a moment) before leaving, but that’s just one more thing to do when I’m in a hurry. Instead, wouldn’t it be nice for your coat rack to tell you just how warm it is outside? There isn’t a lot of information on this concept, but the Online Coat Rack was created to tell you what you need to wear outside. It features 5 hooks, which you would place different jackets (and even an umbrella) on. The device would be hooked up to the internet so that it can grab the latest weather report. A simple orange bar moves from side to side, staying over the article of clothing you’re most likely going to need. I wouldn’t mind seeing this concept turned into a reality, especially since it does seem to be something that could be made rather easily.